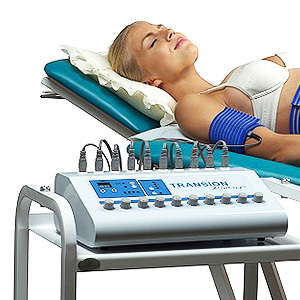 Transion equipment gives you quick and easy results without having to go to the gym. You can see result in its very first session, rather than having to endure many weeks of work outs. The result is a versatile and effective workout. Transion treatment may not only firm your muscles, but also speed up your metabolism, relieve fluid retention and stimulate your muscles in to the perfect and correct exercise. Transion treatments allow the user to be selective and reduce the exact area chosen. Transion has 20 electrodes in the shape of rubber pads that send pre-set low-currency impulses to muscles, causing their rhythmic contraction and relaxation. The whole process triggers natural functions as well as chemical changes in the body and muscles, comparable to those occurring during actual physical exercise. These chemical reactions facilitate the removal of inter cellular fluid and toxins. All metabolites are transported to the inter cellular space, causing kidneys to utilize carbohydrates and fat stored in the body for energy. What is more, this has an immediate boosting effect on metabolic processes. Men and women can use the automatic workout of Transion on any muscle groups of the body, for example; upper arms, bust, belly, thighs, back, breasts and hips. A series of treatments are necessary to achieve maximum results, least 3 days a week, but preferably not more than an hour a day. Before and after each procedure, be sure to drink, at least 0.5 liters of water. Just strap it on while you’re resting, reading, net surfing or watching TV and watch your body transform right before your eyes. 45 minutes can compare with 3 hours of real exercise in the gym.